In the recent times, the consumption of oleate esters has been significantly increasing, thanks to their widespread usage in agrochemicals, plasticizers, cosmetics, absorbents, lubricants, and various other products across the world. Several of these products have been finding a tremendous rise in their application due to the upswing in the industrialization, globally, which consequently, has fueled the usage of oleate esters remarkably. Over the forthcoming years, the global market for oleate esters is likely to witness continued growth on account of the infrastructural advancement, worldwide. According to Transparency Market Research (TMR), the opportunity in the global market for oleate esters, which stood at US$1.4 bn in 2015, is likely to rise at a CAGR of 4.80% between 2016 and 2024 and increase to US$2.2 bn by 2024. The shipment volume of oleate esters across the world is predicted to expand at a CAGR of 4.10% over the same time period. Methyl oleate, ethyl oleate, butyl oleate, and tri-methylolpropane trioleate (TMPTO) have emerged as the main products available in the global market for oleate esters. Among these, the demand for ethyl oleate has been higher, owing to its extensive usage in the formulations of lubricants. The segment is projected to retain its dominance expanding at a CAGR of 5.10% throughout the forecast period. On the other hand, the demand for methyl oleate and TMPTO is anticipated to decline over the next few years. Butyl oleate, however, is projected to maintain a stable rise in its demand in the years to come. 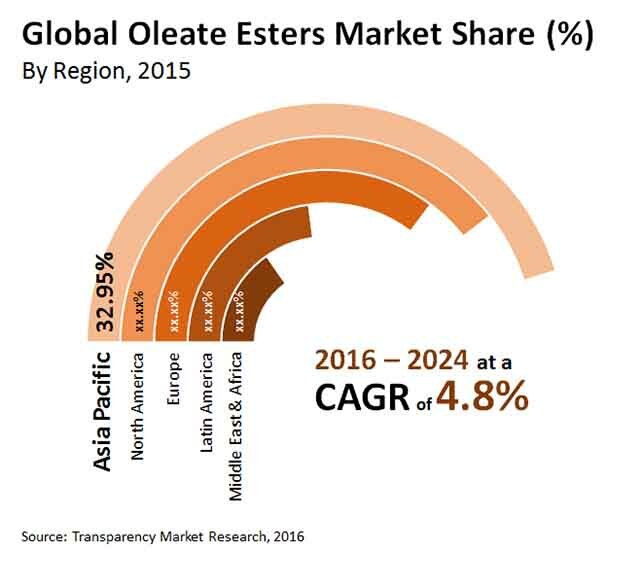 The Middle East and Africa, Europe, North America, Latin America, and Asia are the key regional markets for oleate esters. Thanks to the rising industrialization, Asia Pacific has emerged as the leading contributor to the overall market. Researchers expect this regional market to continue its leading streak over the forecast period. The easy availability of raw materials for oleate esters, the presence of well-established production units, and the continued increase in research and development activities are likely to boost the Asia Pacific market for oleate esters in the years to come. North America and Europe are also registering a significant rise in their respective markets for oleate esters due to the presence of several large production facilities. The growing number of industries is also propelling this market in these regions. Over the next few years, the rising consumption of personal care products is expected to stimulate the market for oleate esters in North America, whereas, the augmenting demand for organic esters will support the Europe market for oleate Esters. Emery Oleochemicals, Kuala Lumpur Kepong Berhad (KLK), Ecogreen OleochemicalsTATA Global Oleate Esters Ltd., Kowa India Pvt. Ltd., Kao Corp., Acme Chem, CHS Endüstriyel Ürünler San. ve Tic. A.?., Mohini Organics Pvt. Ltd., Hebei Jingu Plasticizer Co. Ltd, Italmatch Chemicals S.p.A., Croda International Plc Huntsman International LLC, Procter & Gamble, Victorian Chemical Company Pty Ltd., and Wilmar International Ltd. are some of the leading vendors of oleate esters across the world. Oleate Esters are known as the esters or salts of oleic acids. Esters are synthesized by the reaction between alcohol and oleic acids in presence of catalysts. They are obtained from natural sources such as animal fats and vegetable oils, most preferably palm oil, canola oil, soybean oil, etc. As they are obtained from natural raw materials, they are preferred over other chemical compounds. Generally, oleate esters are manufactured using natural resources such as vegetable oils and animal fats as their raw materials. Besides, the demand for oleate esters is expected to rise in future as well due to rapid rate of industrialization as well as awareness among the consumers regarding the benefits of using them. Due to these reasons, manufacturers are looking for alternative raw materials which can be used as substitutes instead of the conventional natural raw materials. By utilizing chemicals it would be easier to obtain oleate esters at a large scale. The market is expected to experience constant change as a result of improvement in the techniques involved in the manufacturing processes. Due to the constant changes in the market, there can be improvements in the standard and quality of oleate esters, which in turn would change the dynamics of the market. The market players operating are investing large amount of their revenues in the development of new and better products by carrying out R&D activities. This would eventually bring about change in the overall market of oleate esters. The report estimates and forecasts the Global Oleate Esters market on the global and regional levels. The study provides forecast between 2016 and 2024 based on volume (kilo tons) and revenue (US$ Mn) with 2015 as the base year. The report comprises an exhaustive value chain analysis for each of the segments. It provides a comprehensive view of the market. Value chain analysis also offers detailed information about value addition at each stage. The study includes drivers and restraints for the Global Oleate Esters market along with their impact on demand during the forecast period. The study also provides key market indicators affecting the growth of the market. The report analyzes opportunities in the Global Oleate Esters market on the global and regional level. Drivers, restraints, and opportunities mentioned in the report are justified through quantitative and qualitative data. These have been verified through primary and secondary resources. Furthermore, the report analyzes substitute analysis of Global Oleate Esters and global average price trend analysis. The report includes Porter’s Five Forces Model to determine the degree of competition in the Global Oleate Esters market. The report comprises a qualitative write-up on market attractiveness analysis, wherein end-users and regions have been analyzed based on attractiveness for each region. Growth rate, market size, raw material availability, profit margin, impact strength, technology, competition, and other factors (such as environmental and legal) have been evaluated in order to derive the general attractiveness of the market. The report comprises price trend analysis for Global Oleate Esters between 2016 and 2024. The study provides a comprehensive view of the Global Oleate Esters market by dividing it into product, application and geography segments. The products have been segmented into ceramics, glasses, polymers, composites and metals & alloys (M&A). The applications are segmented into medical devices, automotive, aerospace, electricals & electronics (E&E), industrial, power and others. These segments have been analyzed based on historic, present, and future trends. Regional segmentation includes the current and forecast consumption of Global Oleate Esters in North America, Latin America, Europe, Asia Pacific, and Middle East & Africa (MEA). Market segmentation includes demand for consumption in all the regions individually. The report covers detailed competitive outlook that includes market share and profiles of key players operating in the global market. Key players profiled in the report include Procter & Gamble, Wilmar International Ltd., and Croda International Plc. and Others. Company profiles include attributes such as company overview, number of employees, brand overview, key competitors, business overview, business strategies, recent/key developments, acquisitions, and financial overview (wherever applicable). Secondary research sources that were typically referred to include, but were not limited to, company websites, financial reports, annual reports, investor presentations, broker reports, and SEC filings. Other sources such as internal and external proprietary databases, statistical databases and market reports, news articles, national government documents, and webcasts specific to companies operating in the market have also been referred for the report.